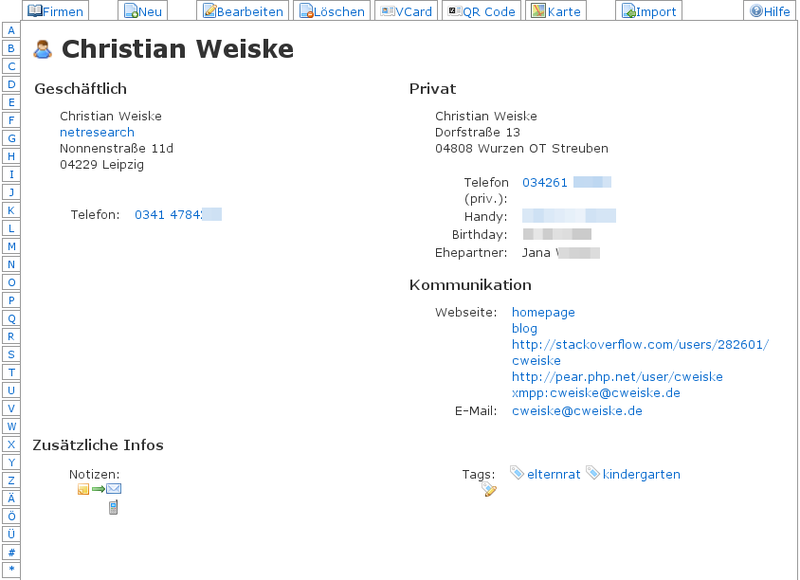 In 2007 I opted for evolutionPerson.schema as address book schema on my LDAP server. Time has passed, and I export the LDAP entries onto my kitchen radio, query it when someone calls and display that information on my television. It's also used by all the email clients in the house of course. In all the years, I've been using JXplorer to edit the data. It worked, but was not comfortable and definitely not wife-compatible. 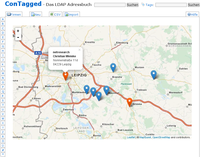 Some days ago I stumbled across ConTagged, a web-based LDAP address book editor written in PHP. Finally! Apart from being written in PHP does it support the evolutionPerson schema out of the box, has a nice interface, supports public and private addresses, map display, CSV and vcard export, and displays QR codes for easy mobile phone import. And tags/categories. Wow. config.php was checked into the git repository. You should never do that and rather use a config.php.dist file that users have to copy to config.php. The LDAP directory was searched at one level ony; now it searches the whole subtree. Tag cloud display was broken and not compatible with PHP5. vCard generation was broken; it conforms to the spec now. Modifications to the LDAP field mapping had to be done in inc/fields.php that is also checked into the repository. Now the changes can be managed in config.php. Multiple URLs are supported now. 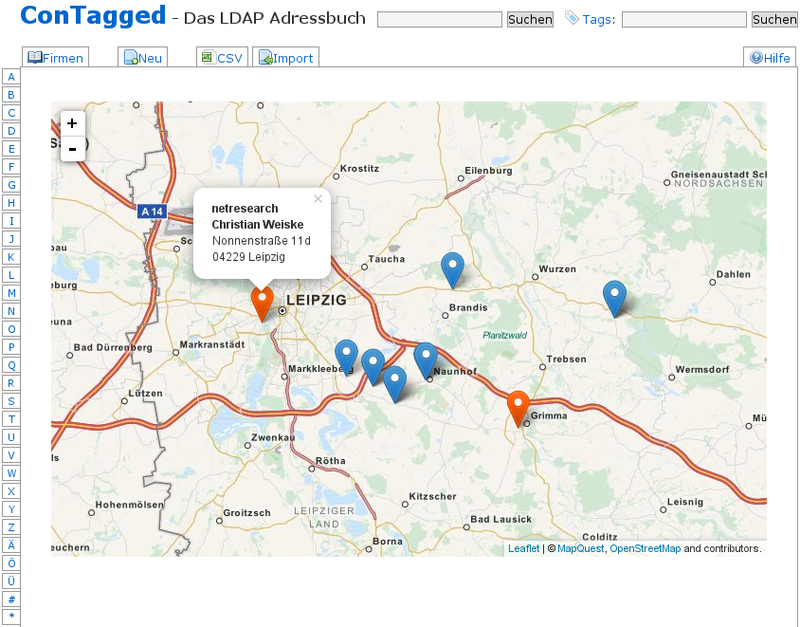 Instead of using Google Maps, I've switched to OpenStreetMap + LeafletJs, and MapQuest's Nominatim instance for geocoding. Maps look better now and don't require an API key anymore. Both private and business addresses are shown on the maps now. After those fixes, I have a nice LDAP address book editor that I enjoy to use. See my git repository for the code.